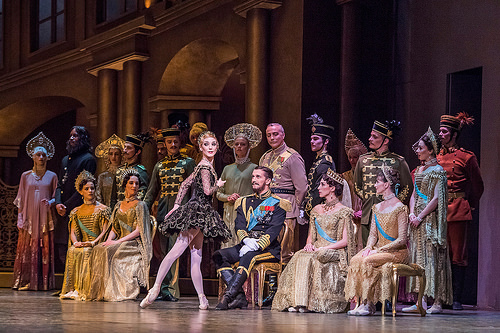 Earlier this month I attended a performance of the Royal Ballet’s extraordinary production ‘Anastasia’. In gorgeous and arresting dance and music, events were portrayed surrounding the young Grand Duchess Anastasia Romanov. In Act One we met Tsar Nicholas II and his family enjoying a holiday during the summer of 1914 on their grand yacht Standart. Anastasia, the youngest and most attractive of the four daughters, whizzed onto the stage on roller skates – quite obviously the love of both her family and the Russian sailors. Their shared happiness was interrupted when news of war against Germany arrived and the Tsar left to join his army. 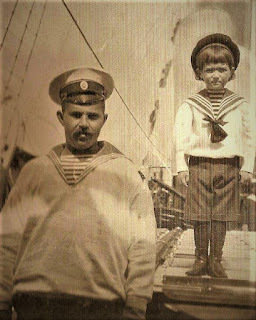 Little Tsarevich Alexei Nikolaevich Romanov on board the imperial yacht with his carer the sailor Nagorny. Act Two began with Anastasia’s coming-out ball. Amid much joyous dancing, Rasputin loomed menacingly, slithering between the Tsar and Tsarina. Vast chandeliers hung over the scene in a disconcerting un-perpendicular way, prompting the question – was what we were seeing real or imagined? Anastasia’s privileged life came to an abrupt end with the storming of the Winter Palace. The music in these acts came from Tchaikovsky’s first and third symphonies, and the dance was classical in style. Act Two of Anastasia , Royal Ballet, 2016. C 2016 ROH, photo by Tristram Kenton. The third and final act provided a stark contrast and was if anything more enthralling. 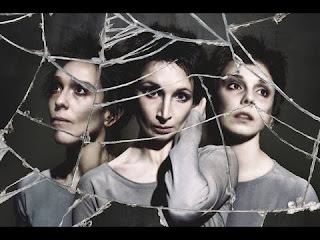 With modern dance set to electronic music and Martinů’s 1953 Symphony, the setting was now an austere mental hospital with a single bed and uniformed nurses. The story told was of a young woman fished out of a Berlin canal in 1920 whom many people believed to be Anastasia herself, the sole survivor of the massacre of the Romanovs in 1918. She had been found without any papers and was called simply Fraulein Unbekannt, or Miss Unknown. In the anguished title role, Natalia Osipova danced in a state of unsettling frenzy. When not sitting inert and motionless, staring at silent newsreels of her previous life, she threw herself around, light as a feather but taut as steel, wrenched by a juddering forces. Traditional ballet movements, such as a grande jeté (big leap) were subverted as she pushed against an invisible wall. Memories and nightmarish fantasy intermingled in her recall of surviving assassination and an attempted suicide. Writing in The Guardian, Judith Mackerel described ‘violent shards of dance evoking fragments of Romanov history and a mind boiling and buckling with insanity’. Natalia Osipova as Anna Anderson in Anastasia. C ROH 2016, photo by Tristram Kenton. It mattered little to her many devotees among the White Russians living in the West, that Miss Unknown spoke no Russian, English or French but only Polish and German; that she looked nothing like Anastasia; and had forgotten her table manners. A German law court spent thirty years weighing the evidence for the patient’s claim before deciding that ‘it could neither be established nor refuted’. After Miss Unknown became Anna Anderson and left the mental hospital, she married an American amateur historian called Jack Manahan and lived in an untidy house full of cats in Charlottesville, Virginia. Ten years after her death in 1984, DNA tests identified her as a Polish peasant, Franziska Schanzkowska, who had suffered severe trauma during the 1914-18 war and then been forgotten by her family. When the bones of all the Romanov family were eventually exhumed, their DNA was tested against HRH Prince Philip, the closest known living relative, and this confirmed that the Grand Duchess Anastasia’s death had indeed occurred in 1918. MacMillan's wonderful reworking of this story is a must-see for History Girls, illustrating vividly the complex psychodrama of a woman’s memory and identity. Catch it at the Royal Opera House or in a cinema near you. Queen Alexandra's Christmas Gift Book -photographs from my camera, Daily Telegraph 1908. Frances Welch, The False Grand Duchess Anastasia, Royal Ballet, 2016. It sounds like a wonderful ballet! I'd love to see it. This sounds wonderful - will look out for it in cinemas. Spouse and I don't mind if a ballet, novel or film is largely based on the true history, has a passing relationship to the truth or is a total Disneyland fantasy. We will still want to see the ballet, if it comes here. The trouble is that there were many Russian royalist refugees who desperately wanted Anastasia to have survived. Alas the Great Pretender story was battled in the courts for decades.